Parallel and Distributed Systems Lab (PDSL) performs research in all aspects of parallel and distributed systems with a particular emphasis on design methodology for model-based development on multi-/many-core processors. Application domains of special interest include hardly parallelizable control systems such as automotive power-train systems. PDSL is in collaboration with Embedded and Real-Time Systems Lab (ERTL) at Nagoya University. We are also participating Embedded Multicore Consortium (in Japanese) and SHIM WG of Multicore Association. A part of our research results is applied to eMBP of eSOL Co., Ltd., and RH850 Multicore Model-Based Development Environment of Renesas Electronics. Please see Japanese Page as well. 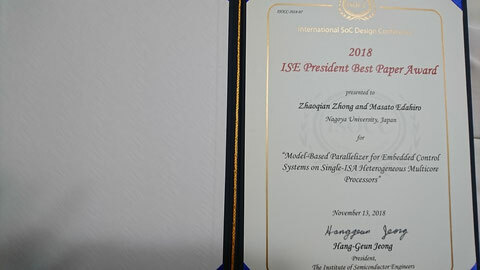 Zhaoqian was awarded ISE President Best Paper Award at ISOCC 2018. Sujiwo was awarded the best conference paper at IEEE MFI 2017. Upload video showing our parallelization flow to AUTOSAR OS for an example of RC car. Professor Shinpei Kato has moved to University of Tokyo.